Posted by Candie Kates on Aug. 18, 2016 10:30:21. Text messaging is the basic function we use heavily since the introduction of mobile phone. And it is still one of the core features in nowadays even new technology consistently added to smartphone. Some of us have the habit of reading old messages received from our friends or family members. If you use a Samsung Galaxy phone, some incidents might happen suddenly on your phone when you browse through the messages. Because a simple touch would get the messages deleted. This is quite common for those whose kid can access the phone. In addition, other cases such as system crash or software update would also cause the message being deleted. It is a not a big deal if you already backed up the messages on Galaxy phone. However, most Samsung Galaxy phone users forgot to do this because sms backup is not as easy as photo, which can be backed up on various cloud storage services. People are lazy at complicated staff. So, is there any way to restore those lost messages without backup? The answer is Yes. With the help of special data recovery program, you still have chance to recover the deleted messages. 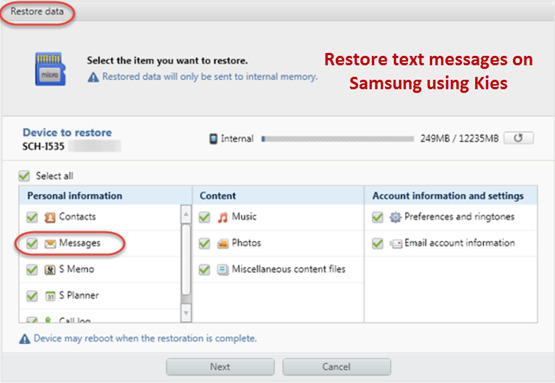 When you backed up Samsung phone previously, then it is kind of easy to restore deleted messages from the backup. In fact, there are a lot of backup apps and software on the market. But the most frequently used ones are Samsung Kies or Samsung Cloud for Samsung Smart phone users. Restoring SMS from Kies Backup: First, you should make sure you already backed up the phone with Kies. You can easily confirm it by connecting your phone to computer. Kies software should be launched automatically once the phone was recognized by the computer. Now navigate to "Back up/Restore" tab, choose the backup file, and click "Restore" button to recover messages. 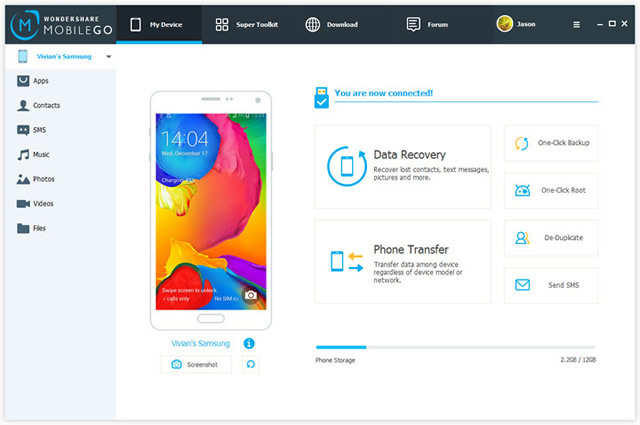 Restoring from Samsung Cloud Backup: When you bought a Samsung smartphone, you will be asked to sign in with Samsung account or create a new one. Once logged in, you are able to backup all kinds of data to Samsung cloud, which is similar to Dropbox, Google Drive or iCloud. Now open Settings app on Samsung phone and scroll down the page to find "Backup and Restore". 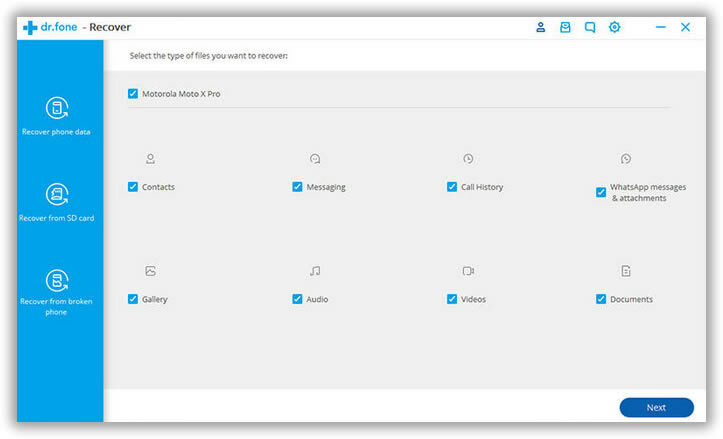 Under Samsung account column, you can restore contacts, sms, clock, and settings from "Samsung Cloud". Tap "Restore" option and all the backup will be displayed in a minute. Finally, you can recover messages from selected backups. Note: The new data, which was saved on the phone before the date of backup, will be erased if you decided to recover sms from existing backups. So, you should first backup the phone first before restore. TunesBro DiskLab for Android is a full-featured data recovery tool designed for Android users. It can recover lost or deleted text messages from different cases. With this data recovery application, you can just preview all the deleted messages and can choose only those that you wish to recover. 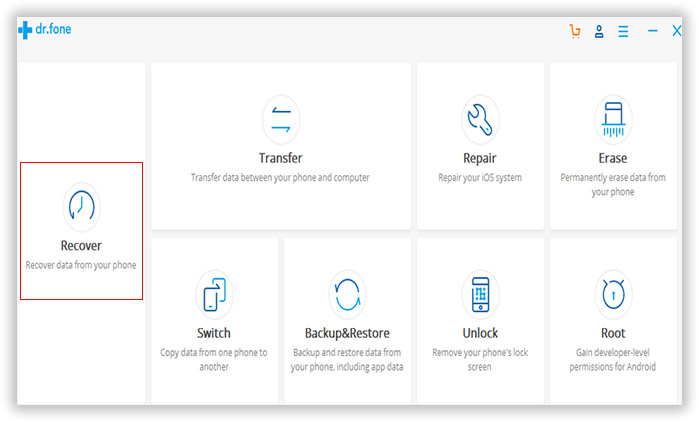 Besides sms recovery, DiskLab for Android can also recover other types of data, including contacts, WhatsApp messages, photos, music, video and documents. Tunesbro aims to provide the best satisfaction of their customers. So, if you have any question about the app, you can just contact them and they are at your disposal to clarify your doubts within 24 hours. Supported Samsung Phone : Galaxy S7/S7 Edge, Galaxy S6/S6 Edge, Galaxy S5/S4/S3, Galaxy Note 7/5/4/3 and other Android based Samsung phones. First, download the setup file of DiskLab for Android. Then install the program on your computer later. There is no hassle in this step. Just follow the instructions. You need to open the program after installation. Note: Here is the guide for Android contacts recovery and Android photo recovery. Please check it if needed. 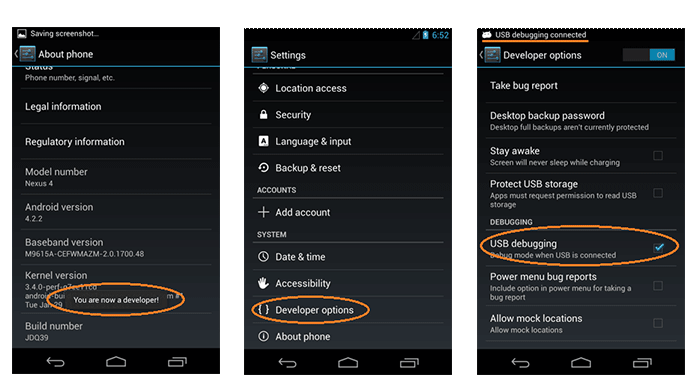 For Android 4.2 and higher: Settings -> About phone, touch Build number 7 times to open Developer options. Now go back to Settings -> Developer options, turn on USB debugging on there. For rooting, here is the detailed guide on how to root your phone. Plug the phone to computer with USB cable. If everything goes well, then it will be detected by DiskLab for Android. Now, click Start Scan button to let the program fully scan all the data stored on the Samsung phone. Please wait a few minutes for the scanning process. All scanned files will be put into different categories as you can see from the left sidebar. Click Messages column, where you can see all the messages including deleted ones in there. The deleted ones are marked as red or you can switch Off button on the top. Click the ones you wish to restore and finally click Recover button to save them on computer. You might have deleted all the messages from your Samsung phone and some of them may be important, while others are not useful messages. So, when you recover all those messages, they will just occupy unnecessary space in your phone. On the other hand, when you can recover only those messages that you feel important to be present, it would be great, isn't? This is what Tunesbro offers. If you are not a technical person, user-friendliness is highly important, as you can't get into the technical details of any application. This is what the data recovery application should assure you when you are in a very urgent need. In addition, the application should directly scan for your lost messages from your phone and should recover them safely. Both features are assured by TunesBro DiskLab for Android. So, there is no need to worry about it any more. The most effective way to protect your messages on Samsung phone is to backup them in a safe and convenient way. As we stated above, Samsung Kies is only able to restore messages as a whole and will overwrite new messages before backup. In addition, you have no way to view the text messages in backup file. Fortunately, there is a great solution for now. Android Manager is all-in-one data management app for all Android devices. 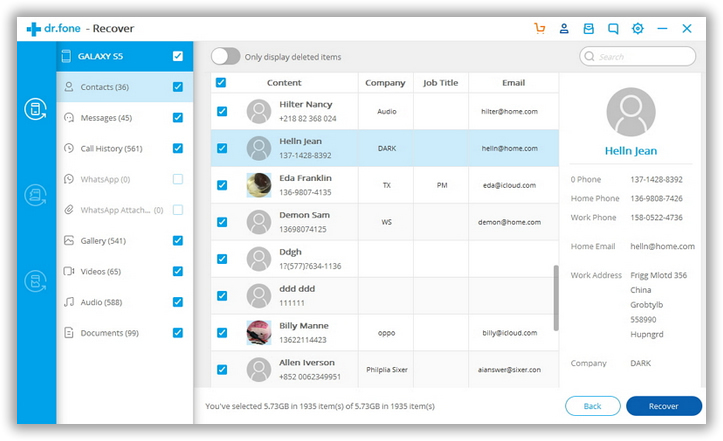 It can backup the whole device or individual data such as sms, contacts, photos, etc. Taking messages for example, you can transfer the messages form Samsung phone to computer in txt or xml format, which you can read them via text editor. Once you deleted text messages accidentally on your phone, you can quickly restore the messages via the same app. Plus, it is very easy to backup sms to computer with Android Manager. First, download and install the program on a computer. Then connect your Samsung phone to computer via USB cable. Once the phone was detected, click SMS icon on the left sidebar. Finally, select the messages you wish to backup.